Now you can create your own ringtones free of cost with Ringdroid on your android based mobile phone. 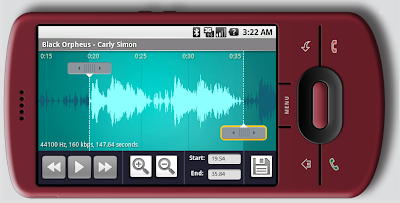 Ringdroid lets you edit any MP3 on your phone or record a new sound and turn it into a ringtone, alarm, or notification. The only graphical waveform editor you'll find on a phone! This application supports wav,mp3,amr,3gpp formats. If you have a T-mobile G1 handset, just click on "Market" and search for "Ringdroid" to install it, else you can download from Google ringdroid site.